I just posted earlier today about some different foliage that Marvin Gardens featured at this year’s Philadelphia International Flower Show. That made me think about all of the other plants that we featured, of which my favorite has to be the Meyer Lemon Tree. Meyer Lemon Trees bear large, juicy, thick-skinned lemons at an early age. But even if there were no lemons to bear, with its glossy leaves, white flowers and intense fragrant, it would still be attractive enough to grow anyway. And if space is an issue for you, they are small enough for urban balconies and limited-space gardens. 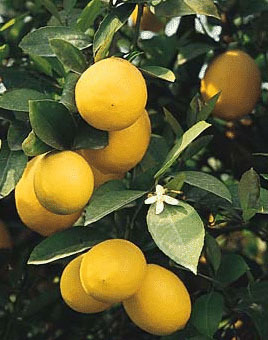 Most single citrus tree should be pruned so that it is smaller at the top, and bigger at the bottom, allowing for more surface area to receive sunlight. The popular instructional website eHow.com actually has a great article on how to care for a Meyer Lemon Tree. One more thing…if you like to add a little lemon to your water, once you harvest your tree (and prior to pruning, of course) you can freeze your fresh squeezed lemon juice in ice cube trays. This is a terrific way to serve water with a hint of tart lemon juice. If you’re interested in more info on how you can grow your own Meyer Lemon Tree, contact us here at Marvin Garden.